A hoodless sleeping bag is a great option for front or side sleepers who get tangled in the hood of a traditional bag. Check out our top picks for 2018. As a front and side sleeper, I used to get sick of being tangled in my sleeping bag hood. So when I stumbled across hoodless sleeping bags it was like a lightbulb moment. Why even bother with a hood? Why not just wear a warm hat if it gets cold? Hoodless sleeping bags are more versatile, comfortable and lightweight than their hooded counterparts. In short, a hoodless sleeping bag is great for front, side or restless sleepers who find themselves getting tangled in the hood of a traditional bag. We find them more comfortable than a traditional bag, owing to their somewhat more "symmetrical" design. In many climates a hoodless sleeping bag will be warm enough as-is. However in cold conditions you may need to wear a warm hat, a hooded jacket, or use a detached goose down hood. Once the temperature really drops, for example below freezing (~32°F or 0°C), we usually opt for a traditional sleeping bag with a connected hood since it works better at preventing cold drafts. Note that for even more freedom of movement, consider an ultralight backpacking quilt. Some of the designs below are like a quilt / sleeping bag hybrid. However, a true backpacking quilt does not have a zip along it's entire length. Quilts can be much more comfortable for side and restless sleepers, owing to the extra girth, and work well for temperatures above freezing. For those looking for versatility in their sleeping bag, then the Feathered Friends Flicker 20 UL is hard to beat. The Flicker can be opened up as a blanket on warmer nights, while in colder temps it can be zipped up and the bottom of the footbox cinched in to form a hoodless mummy bag. A novel crossover zipper design helps seal off any drafts along the length of the bag and avoids the need for a down-filled draft tube. When the footbox is cinched in at the bottom, your feet will be cosy in all but the coldest conditions. The Flicker 20 UL is made with the highest quality 950+ fill power goose down. As with all Feathered Friends sleeping bags, the Flicker is conservatively rated. You'll find the Flicker 20 UL warm and cosy for a 20°F rated bag. The Flicker includes a draft collar, which means it is easier to retain warmth in colder conditions (compared to a bag without a draft collar). Nonetheless to push this bag down towards it's temp rating (e.g. below freezing) you will need to pair it with a warm hat, or a down hood. The Flicker 20 UL is made with a 10-denier water-resistant outer shell fabric and a 15-denier liner fabric, ensuring optimal weight savings without sacrificing durability. Note that Feathered Friends do not allow customisation. However they do sell an alternative version of the Flicker known as the YF version (instead of UL). The YF Flicker is made with a slightly heavier shell fabric (20 denier) and slightly lower fill power down (900+). Because of the heavier shell fabric the YF version is slightly cheaper and also more downproof (that is, the down feathers have less chance to escape). If you are willing to spend the extra few dollars, then we suggest going with the Flicker 20 UL instead of the Flicker 20 YF. If you want a hoodless bag for all-round 3 season use, then the Feathered Friends Flicker 20 UL is our top choice. The Enlightened Equipment Convert is a great choice for ultralight hikers, or those who want to try a quilt for the first time without saying goodbye to a zip up bag. The Enlightened Equipment Convert 20° is a great hoodless sleeping bag for hikers who want to minimise their base weight. It includes a pad attachment system that means it can be used in just the same way as Enlightened Equipment's backpacking quilts. Nonetheless, it also includes a full zip, which means it can also be used an enclosed sleeping bag. It is great for those hikers who want to try a quilt for the first time, with a true quilt-style pad attachment system, but also want to retain the security of having an enclosed sleeping bag for if they need it. The 850 fill power down option also means that this hoodless sleeping bag is slightly cheaper than some of the competition such as the Feathered Friends Flicker or the Zpacks Classic. However, as with all Enlightened Equipment sleeping bags and quilts, you can opt for a higher quality - and more expensive - 950 fill power down which in fact puts all of our top rated hoodless sleeping bags on the same playing field, cost-wise. One thing we love about Enlightened Equipment gear, is that almost everything is customisable. So in addition to being able to choose the quality of the down fill, you can also choose the shell and liner materials. The default option is a 10-denier ripstop nylon. But, 7-denier or 20-denier options are available for those who want to reduce the weight further or want additional durability and water resistance. You can also choose from a wide range of fabric colours. The one downside of the customisation is that it will lead to longer wait times (usually around 3-5 weeks). We like the cosy feel of a draft collar, so overall we think the Feathered Friends Flicker has a slight edge over the Enlightened Equipment Convert in terms of comfort. However, the Convert is available in a much wider range of temperature ratings (-10° through to 50°F) compared to the Flicker (20° through to 40°F). And for a given temperature rating, the Convert is a lighter bag overall (e.g. with the 950 fill power, the 20°F rated Convert is about 100 grams lighter than the 20°F rated Flicker). So although we think the Feathered Friends Flicker is a slightly nicer hoodless sleeping bag overall, we recommend the Enlightened Equipment Convert to hikers who are trying to minimise their base weight to the lowest value possible. Zpacks Classic Sleeping Bag is ideal for the ultralight backpacker. The Zpacks Classic Sleeping Bag is an ultralight hoodless bag made with 900+ fill power goose down. Although not quite as warm as some other 20°F rated sleeping bags, this ultralight bag does pack in a lot of warmth for how much it weighs. Zpacks use a 10-denier ripstop nylon for both the inner liner and outer shell. Their default design include a 3/4 length zip with no draft tube. This provides weight savings compared with a full length zipper and draft tube. With no draft tube, Zpacks suggest the user sleeps on top of the zipper to prevent drafts entering along the main body of the bag. But positioning the zipper underneath your body only works if you do not toss and turn during the night. If you are a restless sleeper, or plan to use the bag in a wide range of climates, consider switching to their Full Zip Sleeping Bag which includes both the full zip and a draft tube. This will add about 3.2 oz (90 grams) of weight but it will increase the versatility of the bag; a draft tube helps preserve warmth in colder temps, and the full zip means you can open the bag up on warmer nights. The top of the Zpacks bag can be cinched in around your neck using the drawcord, and is secured using a flat clip. 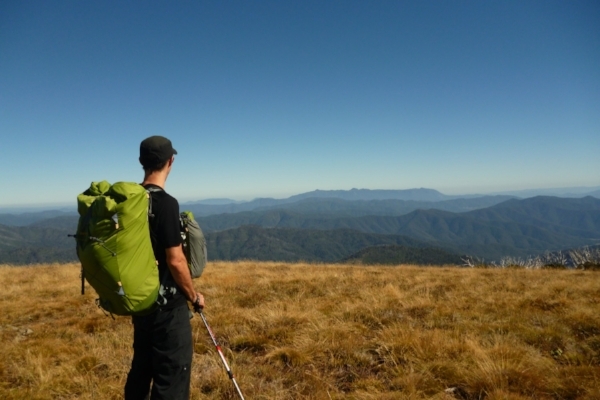 In minimising the weight of this ultralight bag, Zpacks chose not to include a draft collar. Some people they may find this minimalist design less comfortable and cosy than a full draft collar like found on the Feathered Friends Flicker or Katabatic Gear Alsek. Finally, one great perk of purchasing a Zpacks sleeping bag is that they all come with an ultralight waterproof roll-top dry sack. The use of high quality goose down (e.g. 800+ fill power) provides much better warmth for weight compared with synthetic insulation or lower quality down. Aim for a down bag with the highest fill power. The higher the fill power, the better the warmth for weight. But of course, with a higher fill power comes a higher price tag. A tapered mummy bag will be lighter than an otherwise equivalent rectangular bag. A quilt will generally be lighter than a traditional fully-enclosed bag (and sometimes more versatile). Do you need a full zip? Perhaps consider a 3/4 zip over a full length one. But be aware that you might be sacrificing some versatility by being unable to open up the footbox. Consider going with a hoodless bag. As well as providing weight savings, they can be more comfortable for some front or side sleepers. Consider using a backpacking pillow or sleeping pad sheet to reduce the discomfort of sleeping against your sticky sleeping pad. For the most part, manufacturer temperature ratings are massively exaggerated. In general consider adding 20°F to the manufacturer rating. For example, a 20°F (-7°C) degree rated bag is likely to be comfortable down to about 40°F (4°C) degrees. Below that we believe you would need to be adding warmth by wearing an insulating jacket, for example. In general, women sleep colder than men. So, female backpackers should consider options for purchasing a women-specific bag. As well as being slightly warmer, these bags often have a women-specific cut. Many manufacturers such as Feathered Friends offer women-specific designs. Alternatively, if you think you sleep cold, consider a bag that is rated about 10°F less than you might otherwise have purchased. A draft tube is an extra baffle, filled with down, that runs along the entire length of the bag behind the zipper. It is used to prevent cold air from entering the bag through the zipper. A draft collar is a down filled baffle along the collar of the bag that stops warmth escaping when the top of the bag is cinched in around your neck. Most sleeping bags include some form of draft tube and draft collar. However, some ultralight sleeping bags exclude these features in order to minimise weight. If a sleeping bag doesn't have a draft tube, then you can sleep on top of the zip to try and prevent drafts in cold weather. In general, if you plan on using your sleeping bag in temperatures below freezing then we recommend purchasing a bag with both a draft tube and draft collar.